With the Seattle Fringe festival again playing out on Capitol Hill, the crow talked with some of the artists on the bill in 2014. What inspired this new work? It sounds like pretty intense material. On Christmas Day of last year my ex committed suicide. I was completely distraught about it. And one of the ways I deal with things is I create stuff. And I ended up writing a play based on the experience. I think it was different for me this time, it just seemed to be so natural — it flowed well. I was inspired. And think it had to do — there must have been some sort of spiritual element about it that made it so easy to write. … can you say more about that? You could say he probably helped me from the other side, if you will. Is this pretty raw for you to put out in front of an audience so soon? Or is that just part of your process? I’m used to it by now. I think when I first started writing years ago, ’96 or so, that rawness was intimidating. I now I realize it has to feel that way to be effective. I think that’s where the real sharing of experience is. If it’s not that raw, it’s probably not worth sharing. But the intensity of it is just one aspect, there’s also humor, lightheartedness, etc. Do you have any hope for what this might do, putting the play out there for an audience? I just hope that they’re intrigued by it, and have some sort of take away from it, entertainment value or otherwise. I know it happens more than anyone really wants to talk about — you know, suicide. There must be a statistic out there that says gay men are [a certain percentage more likely.] It is a hard life to live. But that’s the message of the play. Regardless of how hard it is, there are things to love about your life, and when you’re ready, it’s time to move on and live. What do you make of the fall of the previous Seattle Fringe Festival, and the rise of the new Seattle Fringe Festival, albeit on a smaller scale? I think there’s an ebb and flow. Things die down then they start up again. I think it’s more indicative of individuals, because individuals run organizations. And people can be passionate about it, and they burn out. Is having this show premier in Capitol Hill have any significance for you? I guess growing up I’ve always considered Capitol Hill the artistic center. The gay center. So the fact that it worked out that way is a bonus for me. It feels like a fulfillment of all parts of me. What would you say to someone interested in coming to see the show? Your show is based on adaptations of works by HP Lovecraft. Why that writer? He’s influenced so many of the horror stories for the last 100 years since he stated writing — has influenced so many other writers, so many other stories. … Even Aliens was influenced by Lovecraft. Is doing adaptation new territory for you? It is. One of the cool things about the Fringe Festival is that it’s almost like an incubation lab for new works, and this is — I’ve been performing around Seattle for the last few years. But this is really my first chance to go off and create something, in terms of a play. It’s a great opportunity that the Fringe Festival has given us, to be able to create this. Because it’s hard to just come out of nowhere and just produce your first play. And they sort of allow you to do that, which is awesome. 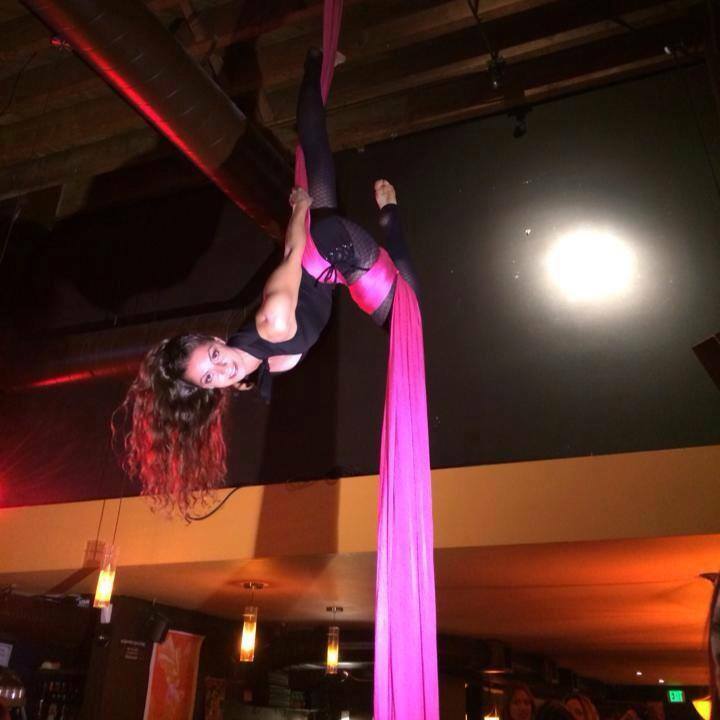 I do performing more as an aerialist, in circus shows. … I’ve done nightclubs like Nectar or the Triple Door. Benefits. Fred Wildlife Refuge. I was at the Seattle Snowball last December. Things like that. I notice you’re bringing elements that aren’t always seen as theater in to the show? Yeah, we’re actually breaking a few of the rules of theater. We have a burlesque performer, Morgue Morrighan, she’s performed all over town, she’s very popular, she’s in our show. Along with a couple of modern dancers we have in our show. So it should be interesting. 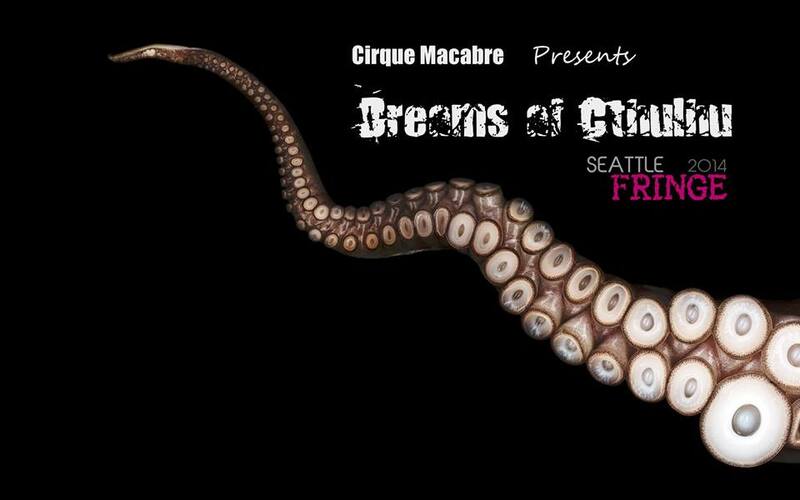 The fact that we’re bringing dance, burlesque, circus and theater all together in one show. You mentioned a scene with a “20-foot tall tentacled beast.” This sounds like a pretty large-scale production for a fringe festival. It is. And that’s one of the other challenges of the fringe festival, the fact that the load-in requirements [15 minutes in, 15 minutes out] you can’t have too many complex sets. We’re actually bringing in a free standing aerial rig, which is the majority of our set. And we’re actually using the fabrics themselves as portions of our set. Are you from Capitol Hill? Still live here? Yeah I still live on Capitol Hill. I’ve lived on Capitol Hill most of my years. How do you see the Fringe Festival coming back reflective of a current wit the arts and theater scene in Capitol Hill? I can’t really speak so much to the theater realm. But I do know the arts. And I see a lot more arts explosion here in terms of dance. Velocity Dance Center opening up on 12th. Exit Space doing there work at Erickson Theater … And circus arts as well. Q nightclub has done a great job of hiring aerialists to perform. There’s one there almost every weekend. There’s just lots of opportunities for performance. I think that the people that come to Capitol Hill are starting to frequent these places more, and are giving these people more a chance to succeed. But it’s hard to start up a show and produce everything and get the space and be able to sell enough tickets to actually make it work. Not even talking making money — just break even, please! It’s hard to do that. And it’s great that the fringe festival is helping us produce these shows, because I don’t think it could happen otherwise. 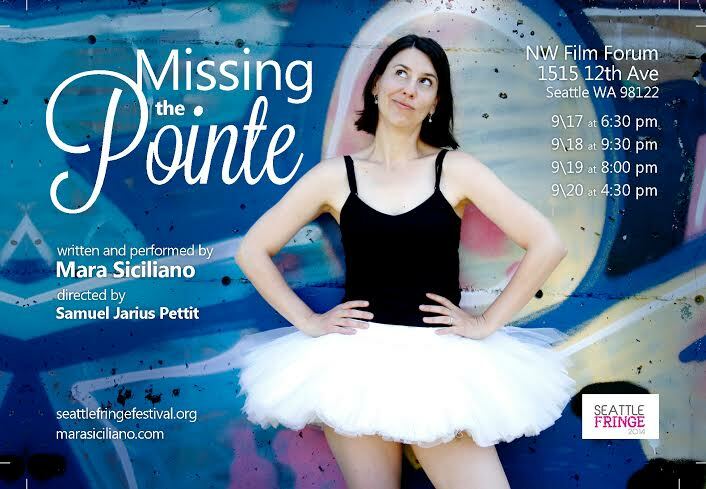 What inspired the narrative of Missing the Pointe? I know so many people, especially girls, that were aspiring dancers. But there’s very few — a very small percentage — that end up having ballet careers. We can’t all be the next amazing, huge dancer. So then what do you do with all that passion and drive, or love of ballet? Just wanting to be a ballet dancer? And I’ve actually been working on the show for 12 years, writing down memories of being in a childhood … company, attempts at trying to mainstream my big dance moves at the middle-school … and having it go really badly, practicing in front of my mirror and thinking it was the best thing in the world, then putting it out in the world and having some uncomfortable moments, if that makes sense. And when your in ballet, for girls its about getting your point shoes. I was on pointe for five years and it made me a way worse dancer. … I had to realize that as a teenager, like — ‘I just don’t think I’m cut out for pointe dancing.’ that’s it for ballet. What else can you tell me about the show? There is excellent music from the 80’s and 90’s — I went through an early electronic synthesizer keyboard phase with that music coming out of the 80’s, and I thought that was the best I’ve ever heard. So there’s ballet with synthesizer music. I was like, ‘this is it, get ready ballet world, for the world of synthesizer music.’ But I was wrong. How has been working with the Fringe Festival been? I feel really lucky. I’ve always used fringe as sort-of a springboard for my work. It is different from the 90’s — they had a lot more theaters, and it was an actual non-profit, and now it’s all volunteer run. But it doesn’t change the essence of it. Anybody can still buy a lottery, any body can still do a show, and if you’re good, people come. It’s a good experience. This is the second time I’ve done the new fringe, but I did three or four shows back when it was really in its heyday. I was lucky enough to be picked in lottery last year, and lucky enough to be picked again this year, and it’s pushing me to do new work … You find out you’re doing the fringe in May and so you gotta make it happen by September, and that’s awesome. That’s pretty short turn-around, it can be. q u e r e n c i a? I feel like anytime I write anything that has some aspect that is very deeply personal. So this piece is loosely autobiographical. It definitely made me feel very vulnerable. And a lot of the subject matter that it sort of touches on is very gritty and even grisly at points. So it’s something that I am little self-conscious about. The Fringe Festival will be the largest audience I’ve ever had for one of my pieces. It’s definitely my most personal. So yeah there’s a nerves that come along with that. But I think it’s an important story. And it is an ‘imagined autobiography,’ an imagined autobiography about forbidden fruit. And so part of it is truth and part of it is fiction as almost all my plays are, so there is still a certain amount of protection that I feel. Though I know a lot of it is drawn from a very deep part of myself. So, it holds a lot of importance. How does it feel to be producing this work in Capitol Hill in particular? One thing I love about Capitol Hill is that is home to the fringe theaters in Seattle. So a lot of them are very close to each other, within walking distance, and I think that’s one of the draws to having fringe in that particular portion of the city is that there will be a lot of crossover in the traffic that goes to four theaters that are involved in the festival this year. And it’s really exciting, even for some of the artists involved. Some of use are using the same venues, or we’re using different venues are not that far removed distance-wise. So I’m really excited that I’ll be able to see a lot of work by other artists that I’ve really admired that are also involved with the festival this year. This particular piece, q u e r e n c i a, addresses gay themes very specifically and even how certain portions of the Latino community interact with individuals who are gay. I thought it was really really appropriate that we ended up at Gay City and in the Calamus Auditorium — it’s the perfect venue for out piece. And not just in a practical way, in that it’s very intimate, it has a brick aesthetic in the interior of the space which is perfectly suited to the very urban feel of the play itself. But also it being sort-of center of the gay community in Capitol Hill, and this play deals very directly with this sort-of coming out story which is one of the aspects of a very complex piece that I’ve written, but certainly a highlighted portion. What’s something that drew you to the festival? I definitely saw it as an opportunity to take some big risks both with the material and just in the practicality of what it takes to put up a show in such a limited amount of time. What’s your perspective on the theater scene in Capitol Hill? I can definitely say one of the draws of Seattle is that I kept hearing about the theater world here, and how it is this emerging city for arts. It seems to be really making a comeback on a national scale. Particularity with the Seattle Repertory starting this writer’s residency for playwrights. But also just the fringe work. I feel like some of the most daring and interesting work is done in fringe, and I’ve gotten to see that first hand since I’ve been here. I’ve seen lots of interesting work, and the people who are involved, they’re all very welcoming and nurturing. And I’ve meet some really wonderful mentors and friends in the theater community here. So, even the short time that I’ve been here, I’ve felt like this is definitely a place I want to be as an emerging artist. To continue to get my feet wet and to continue to play. Can you draw any comparisons between theater in Seattle and LA? I don’t feel like theater there [in LA] has as much focus. It’s definitely very Hollywood-oriented. And a lot of the theater community there is very segregated. And it’s not just a distance thing, in that LA is a huge territory so a lot of places are really spread out. But it’s also a mentality of: you sort of dedicated yourself to one theater and there isn’t a whole lot of crossover of conversation, I feel, between the theaters that do exist there. And I’d say it’s the exact opposite here. I feel like there’s so much crossover between the different theaters here, and they feel they are very connected to each other. One of the things I really love about being here is that I … see artists at one theater, and then I see them at a different theater, and then I see them at another. And I feel like everyone is very supportive of each other. It doesn’t have a dog-eat-dog mentality at all, as far as I can see. This entry was posted in News, etc. and tagged arts, CHS Crow, theater by Jacob Olson. Bookmark the permalink.